(Bloomberg) -- Indonesia rolled its first train through a new underground rail network in the capital city of Jakarta on Sunday, another step in its struggles to overcome traffic gridlock in one of the busiest cities in Southeast Asia. President Joko Widodo, who got the project off the ground in 2013, inaugurated the project, making the 34-year-old dream come true. The seventh president in Southeast Asia’s largest economy instructed an integrated transportation system be built by developing a metro and light rail metro network to compliment an existing bus and commuter rail system. His aim was to ease congestion that costs $5 billion of economic losses annually. 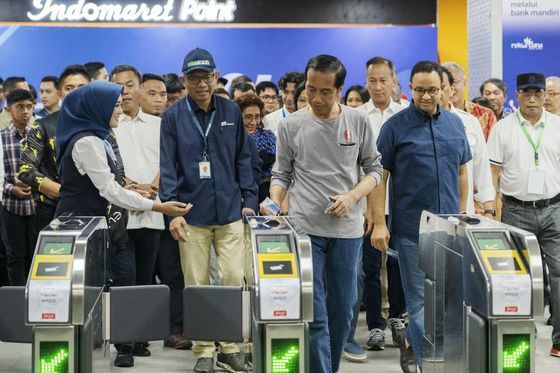 “The MRT phase one, I declared as officially operated today, also the MRT phase two is started today,” said Widodo, known as Jokowi, in video footage posted by the Cabinet Secretariat on its Facebook account. The metro is part of the North-South line. Jakarta is among world’s most-densely populated cities, with more than 10 million residents and millions of commuters from suburbs traveling to the city. Rising vehicle purchases by middle-class consumers, poor access to public transport and floods have caused gridlock. First mooted by former dictator President General Suharto in early 1985, the metro was built with a 125 billion yen ($1.1 billion) loan from the Japan International Cooperation Agency. It connects 13 stations along 16 kilometers (10 miles) from the heart of the city to the business district in the south. It is expected to move 170,000 passengers a day. The government last year signed a 70 billion yen loan for the second phase of the North-South line. The line is expected to carry a total of 433,000 passengers a day when fully operational, while an East-West line will move more than a million commuters. Construction on that line will start this year.